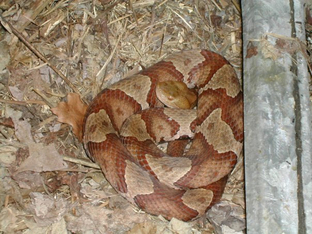 Late one evening in the summer of 2010 I received a wildlife rescue call from a man who said that he had a Copperhead entangled in a piece of yard netting. I asked him if he was sure that it was a Copperhead and he said yes. I was still skeptical because people often confuse several different species of harmless snakes with Copperheads…but whatever kind of snake it was I knew that I had to rush to the scene and try to help the entangled snake. The reason I felt like I needed to rush was that the snake had been stuck in the netting for around 48 hours! I drove the 20 miles or so to the location and found that in fact the snake was a venomous Northern Copperhead and it was severely entangled in a tangled mass of plastic yard netting. The homeowner, a concerned lover of all wildlife, had taken the time to set up a work light over the area where the snake was tangled so it would make it easier for me to work. After looking over the situation I quickly realized that I would need tools to keep me away from the business end of the snake because although I was trying to help it survive, it might not realize that and could potentially envenomate me. I borrowed a pair of scissors and an xacto knife from the homeowner and began to cut away the netting. As I cut I saw that the snake was exhausted. Its lengthy entanglement in the netting and struggling to free itself had pushed it to the edge. It was so tired that it could barely move–it was undoubtedly dehydrated and possibly in shock from spending the day in summers heat even though the homeowner had the foresight to keep the snake in the shade and occasionally sprinkle cool water over it to keep it from overheating–these actions are what surely kept the snake alive until I could free it from the netting. I worked slowly and carefully moving from the tail toward the head cutting the netting one strand at a time. I used scissors where the netting was looser and had to use the xacto knife–a type of razor–to cut the net strands where they were pressing tightly against the snakes’ skin. When I got close to the snakes head I had to be very careful not to hurt it and not to get hurt myself. I was finally able to gently cut the last piece of netting free and the snake went limp and took a deep breath and flicked its tongue a few times. I gently placed a clear plastic tube over the snakes head and first few inches of its body so that I could examine it for injuries without any danger of it biting me. It was so exhausted that it just let me pick it up in the tube and give it a quick check before releasing it into the nearby woods where it crawled slowly toward a nearby creek obviously quite happy to be free. I thanked the man who shared habitat with the snake for taking care of him until I could free him from the netting and felt good in the knowledge that I had helped this small snake survive. Some may wonder why I went to such trouble to rescue a venomous snake. I do so because venomous or non-venomous all snakes are part of a healthy ecosystem and they should be allowed to live and thrive and play their part in a healthy ecosystem. Without snakes and other carnivores helping to control populations of other animals like rodents, birds and insects, nature would quickly fall out of balance and the disastrous consequences of species overpopulation could follow. Snakes are one of the most beautiful and beneficial but also one of the most misunderstood and mistreated creatures on Earth. Please, if you encounter a snake in the wild or in your yard please do not kill it or harm it in any way–step back and marvel at its beauty and complexity and learn more about its uniqueness and connectedness to nature and to all of us. Please consider not using plastic yard netting if at all possible. It is notorious for trapping and killing all sorts of wildlife from reptiles and amphibians to birds and deer. Watch a short movie of this snake rescue below. View all of Naturalist Steve’s nature and wildlife conservation and education videos on his Youtube channel. For more about Earthshine Nature Programs and Earthshine Naturalist Steve O’Neil check out the Earthshine Nature Programs website. If you are a nature and wildlife lover consider visiting Earthshine Mountain Lodge.